It goes against the intuition of some, triggers strong responses from others, and still raises the eyebrows of many: not only did Jewish Displaced Persons (DPs) and German Jews withstand attempts to entice them to make aliyah from Germany post-Shoah and become “local Jews,” but also Russian Jews immigrated in higher numbers to Germany than to Israel for a while, and now Israeli Jews are immigrating to Germany, too. Yet do Jews in Germany see themselves in exile from Israel, or has Germany become their home of choice? 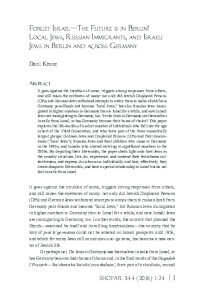 This paper explores the life-worlds of a select number of individuals who fall into the age cohort of the Third Generation, and who form part of the three numerically largest groups: German Jews and Displaced Persons (DPs) and their descendants (“local Jews”); Russian Jews and their children who came to Germany in the 1990s; and Israelis who started arriving in significant numbers in the 2000s. By depicting their life-worlds, the paper sheds light onto how Jews in the country structure, live, do, experience, and contend their Jewishness collectiveness, and express Jewishnessess individually, and how, effectively, they create diasporic life-worlds, and have a special relationship to Israel but hardly feel in exile from Israel.